...is this one, which I took inside an elevator at the Marriott hotel near the conference center. 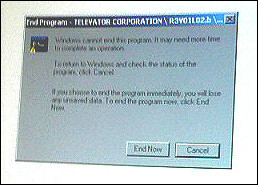 The elevator was fitted with a display screen which usually showed advertisements and news headlines, but for several hours it showed a Windows application error dialog instead. Last week I attended my first Macworld, but it won't be my last. I had a great time, in large part due to the hospitality of Brent F. Simmons and a host of his fellow Mac developers (see you at Denny's next year, folks!). The announcements from Macworld this year paled in comparison to last year's iPhone announcement, but the buzz among attendees was still very high. It was especially high among developers, which I found somewhat surprising since my impression is that Apple doesn't do nearly as much for third-party developers as Microsoft does. In fact, more than one Mac developer I spoke with stated that they develop for the Mac not because of Apple but in spite of it. Of course, it's hard not to be excited when you see your potential customer base growing over the next few years. Several developers I met believe - as I do - that the number of Mac users will increase substantially, thanks in large part to the fact that more and more people are being exposed to the Apple UI via the iPod and the iPhone. Speaking of Core Animation, my favorite product demo at Macworld was Plasq's upcoming Comic Life Magic, which really shows off how to effectively use Core Animation to improve a product's UI. I'd never get any work done if I had that application. That's right, despite being a Windows developer since the early 1990's, I'm headed to Macworld. No, I'm not dropping Windows (at least not yet), but I do want to shake myself up a bit by hanging out with "the other side" for a while. If you're also at Macworld, you should be able to spot me without much trouble - I'll be one of few people there huddled over a Dell laptop. PS: I'm going to throw a hissy fit if I don't come home with an iPhone SDK. "You need to download FeedDemon now! I don’t care what other RSS reader you use, this one is better. The only reason I could conceive before now not to use it was the cost, but seeing as that’s now no longer an issue, everyone needs to use FeedDemon." "Updates to feeds are incredibly fast, much faster than I have ever experienced in any other reader. This is a huge deal for me and is the main reason I have often become infuriated with Bloglines in particular...Did I also mention that FeedDemon has built-in integration with my favorite desktop-based blogging tool, Windows Live Writer?" "FeedDemon has made me use RSS more than I did in the past because I don't have to worry about reading my feed in multiple locations...while Google has done everything possible to make this happen in their web interface it's simply no match for a well designed desktop application." "We have been using FeedDemon for quite awhile (we’re actually paid customers), and it is by far the best feed reader for Windows. 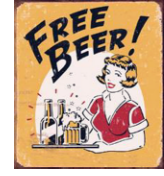 It can handle hundreds of feeds without stuttering, and the fact that it’s now free makes it irresistible!" "I have seen blog posts appearing almost two hours earlier in FeedDemon than in Google Reader....FeedDemon is a very good feed reader." "I’m definitely a winner when it comes to my favorite RSS client...Thanks to Nick and the whole NewsGator team for this ongoing gift." "What the heck are you doing reading this still? Go see why I think FeedDemon is the best feed reader that you can get for FREE!" "The new upgrades from web based RSS readers like Google Reader or Bloglines are tempting but none of them still match the desktop based FeedDemon." "I’ve long been a fan of FeedDemon as in my opinion it is by far and away the best RSS reader on the market. So good that it was worth paying for, even though most of its competitors were free. Well FeedDemon is even better as NewsGator (the company that acquired the product) has made it free." "I’ve used FeedDemon...as my RSS aggregator for several years now. I see that it’s now being offered for free, which is a very good deal indeed, since it is one of the only pieces of software on my computer that I was happy to pay for." "Great news - the gold standard of RSS/Atom/Feed readers on Windows is now free. I’ve been using FeedDemon for two years now and I can’t praise it enough. The free love continues too, because NewsGator Go! and NetNewsWire are also free." "Way Hay! My favourite RSS reader is now available for free...This is a great piece of software, and to have it as a free download is even better." "FeedDemon is one seriously polished, top notch app, that gets even better because the NewsGator backend keeps everything synchronized across multiple platforms." Many thanks to everyone who took the time to blog about FeedDemon, especially long-time customers who continue to use and recommend it! ...is that it's easy to dismiss what people want, because they're not giving you money for it. Sure, I enjoy making money as much as the next guy or gal, but I'm really doing this because it's fun. I like writing software, and I'm going to keep writing it until my fingers break off. There's no point in creating software in a vacuum - you've got to make it useful, make it scratch an itch, for it to be truly rewarding. And to do that, you've got to listen. You've got to pay attention to what people are asking for and what they're complaining about. So, regardless of whether you've paid for FeedDemon in the past or you're a new user now that it's free, I'm not going to stop listening. It wouldn't be fun otherwise. Both points are easily dismissed by the fact that FeedDemon offers synchronization. You can read your feeds on multiple computers and have your subscriptions and read items automatically synchronized between them. And synchronization means that our desktop readers don't retrieve feeds from their source sites. Instead, they're downloaded through the web-based synchronization engine, which makes feed retrieval exceptionally fast. Unlike non-synched desktop aggregators, synched readers don't have to download every single feed to see if something's new. Instead, every few minutes they query the synchronization service to find out whether any of the user's feeds have new content, and if so, they then request the new content (and only the new content) from just those feeds. Most web-based readers can't subscribe to secure feeds. I don't know about you, but that's a show-stopper for me - I have a number of password-protected feeds that I absolutely have to keep track of. Now, I'm not knocking web-based readers - after all, we offer one of our own - but people who choose to use a desktop reader have good reasons for doing so. PS: As I've written before, I think the so-called battle between web and desktop apps is overblown. It's a hybrid world, not an either-or situation.